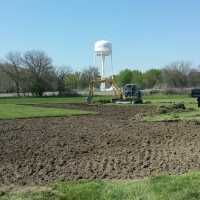 Jamestown Christian Church begins work on new community sports complex. On Saturday, May 2nd, Jamestown Christian Church officially broke ground on what will be the Virgil Benge Community Sports Complex located on the west side of the church campus. This will feature a combination baseball/softball field, soccer field, two basketball goals and an exercise walking path that will encompass the entire property. This project was made possible by a grant from the Greater Jamestown Area Fund, support from the local community and businesses as well as private donations. There is no timetable set for the completion of the facilities. Any donations for the “Get In The Game” project can be sent to the church. Jamestown Christian Church is located at 900 N. Lebanon Street in Jamestown. For more information: contact the church at (765) 676-5182 or email info@jamestownchristianchurch.net or visit the church’s website at www.jamestownchristianchurch.net.